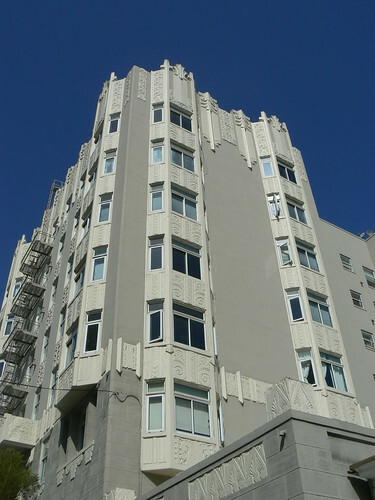 These Art Deco apartments at 1950 Clay, Pacific Heights are spectacular and they are many others that are similar around the area. They tend to follow the same general style. Fantastic decoration along the parapet and below the windows and very grand, decorated entrances. They even have decoartion on the garages as can be seen in the foreground of this photo. 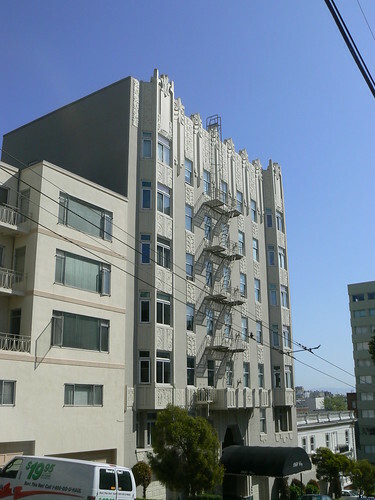 These apartments were designed by Herman C Baumann and built in 1930. 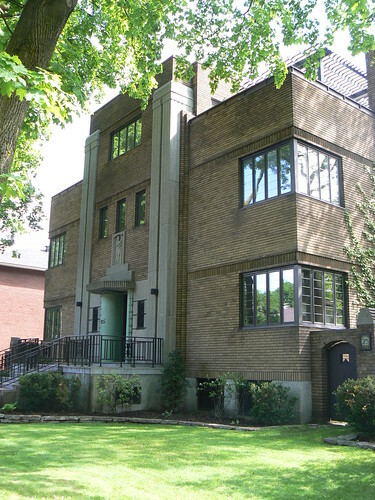 This fine house, the Maison J Donat Langelier from 1931, was designed by Henri S Labelle. J Donat Langelier was in the piano business joining with the Pratte Piano Co in 1926. The house has a wonderful entrance. The door has a very simple, yet very stylish design. The rectangular panel in the bottom section of the door is repeated in the metal railings. 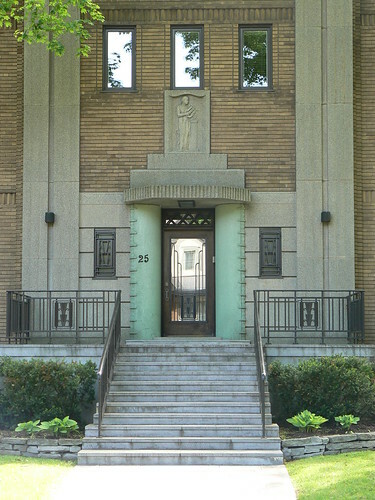 The design is also echoed in the window grills beside the green columns on either side of the door. 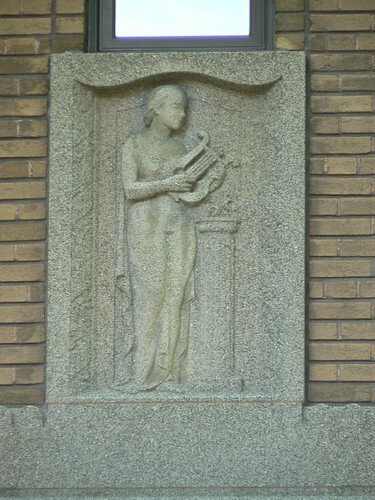 The decorative arrangements around the entrance are topped by a frieze of a female figure playing a lyre. 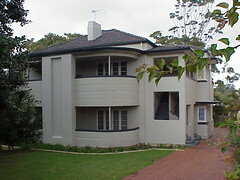 An interesting block of flat around Moore Park in Sydney. 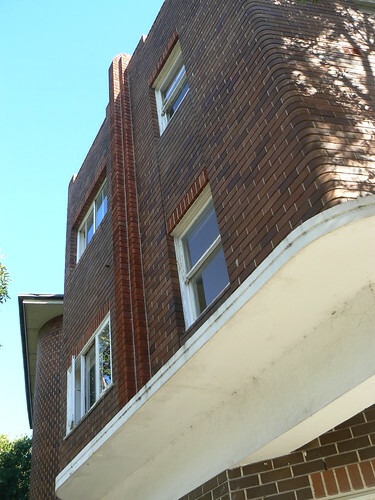 As is common in Sydney this building uses bricks for most of the decoration. 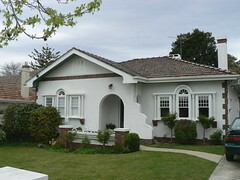 The rampart-style roofline hides a conventional pitched roof and the brick fin is a lovely feature. It almost looks like two separate buildings have been joined by an entrance and stairwell, the tell-tale block of glass bricks providing light for the communal space. At the street level on the corner some work has been done. Perhaps it was once a corner shop or a car crashed into it. It's a pity the brick don't quite match and it leaves that rendered eyebrow wrapping around the corner for no real purpose ... but that doesn't mean I prefer it was removed ... just interested what was originally at that corner. 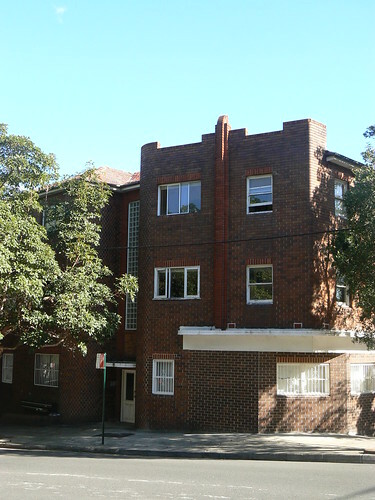 Aaron Bolot designed this large block of flats at 17 Wylde St, Potts Point. 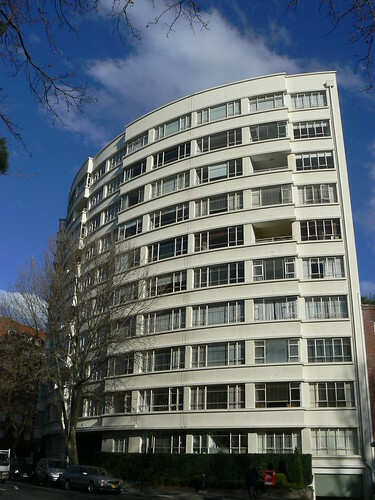 It was constructed between 1948 and 1951 and shows the style of modernism that was appearing in Sydney architecture in the early post-WWII years. The majestic curve of the facade is interrupted by two large blocks of balconies although most have now been enclosed by glass perviding more living space but changing the architect's original vision of the building. Hoje, Brasil e Portugal jogam na Copa Mundial em Durban assim eu pensai eu faria escrever meu blog em Português. Antes de todo, eu tenho que desculpar-se pela algums erros com minha lingua Português. Eu espero você entende que eu estou falando. Eu pude escrever sobre um prédio em Durban ou sobre Anderson Luís de Sousa, naiscido no Brasil mas um jogodor com Portugal, mais conhecido como Deco. Mas o ano que vem o Congresso Mundial de Art Déco será no Rio de Janeiro. Eu estou aguardando com muito prazer. 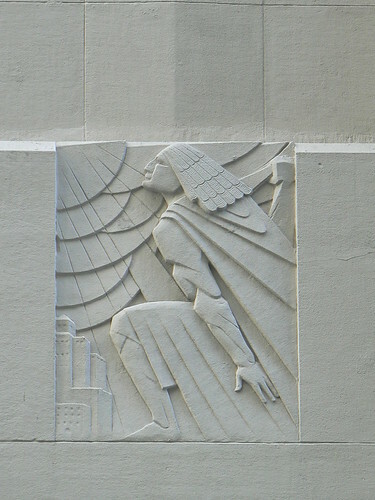 Eu quero ver o estilo Art Déco no Rio como O Cristo Redentor e os prédios com decoração influenciou da Cultura Marajoara. Olhe para website do Instituto Art Déco Brasil para mais informação. Talvez eu te verei lá no 2011. 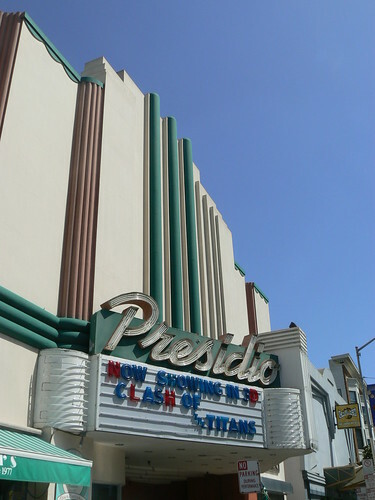 The Presidio Theatre in Chestnut St, Marina in San Francisco is a great little Art Deco suburban theatre. 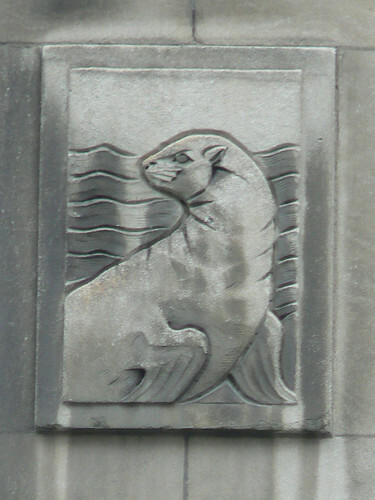 Dating from 1937, it was designed by John H Ahnden. 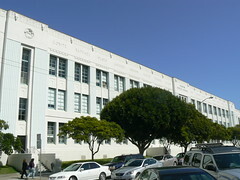 This is Marina Middle School on the corner of Fillmore and Chestnut Streets in San Francisco. 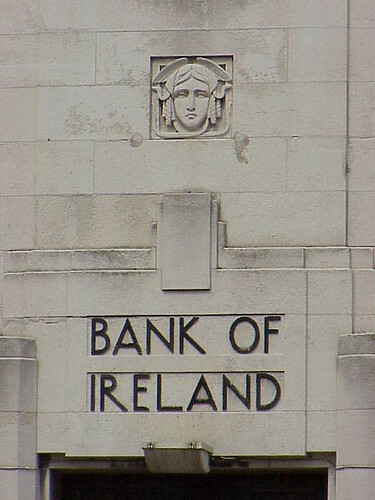 It was constructed in 1936 and designed by George Kelham and William Day. 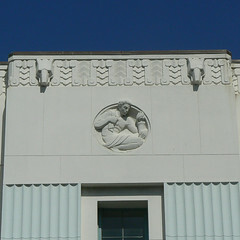 The main school building facing Fillmore St has the names of great men (and they are all men) of science and art. Comte, Raphael, Plato, Galileo, Edison, Homer, Wagner, Euclid, Watt, Emerson, Moses, Milton, Darwin, Newton, Pasteur and Dante. The rear of the building overlooking the schoolyard also bears names including Aristotle and Washington. I didn't list all the names on that side so I wonder if any women are recognised there. 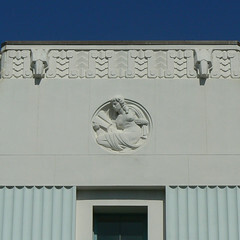 The decoration along the roofline incorporates bear's heads into an Art Deco band. 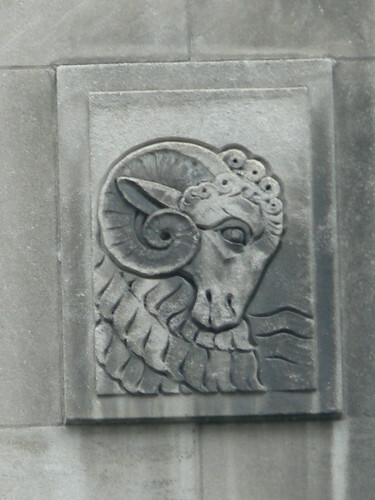 Elsewhere panel at street level include lion's and ram's heads. 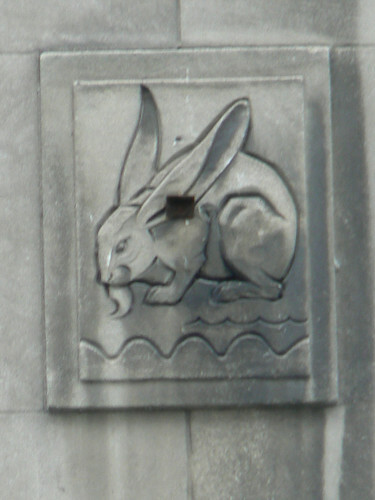 At one end of the building there is a frieze of a male figure carrying a torch and at the other end a female figure with a book. Over 250 people died in the earthquake that struck the Hawke's Bay area of New Zealand on 3 February 1931. In the main towns of the area, Napier and Hastings, many buildings were destroyed as a direct result of the quake and the resulting fires. In Hastings, the main Post Office with its clock tower was one of the buildings destroyed so, as part of the reconstruction, a clock tower was identified as one of the priorities. 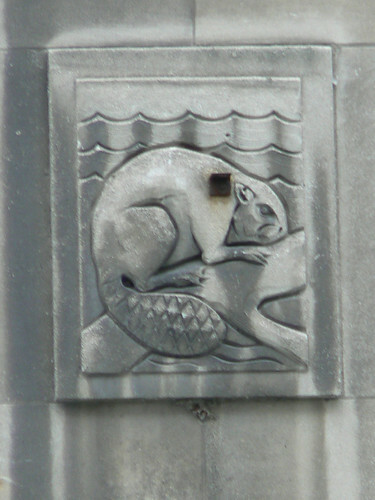 A national competition in 1934 saw local architect, Stanley G Chaplin, provide the winning design which was constructed in 1935. 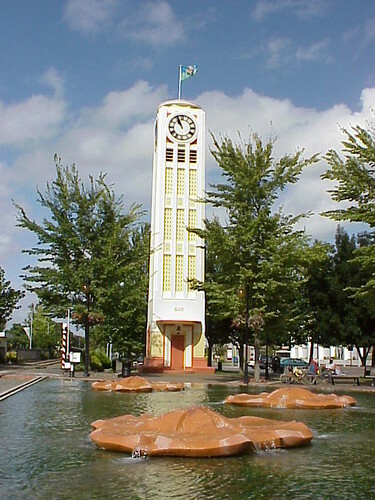 The Clock Tower is registered with the NZ Historic Places Trust and serves as both a landmark of Hastings and as a memorial to the 93 Hastings's residents who died in the 1931 earthquake with their names are listed on panels on the tower. The Clock Tower also returned the sound of the old Port Office bells to the town. They were salvaged from the wreckage of the earthquake and installed in the newly constructed tower. 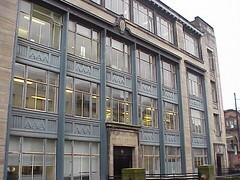 The lettering above the door of this fine Art Deco building in Glasgow reads Incorporated Dental Hospital and it now forms part of Dental School at the University of Glasgow. 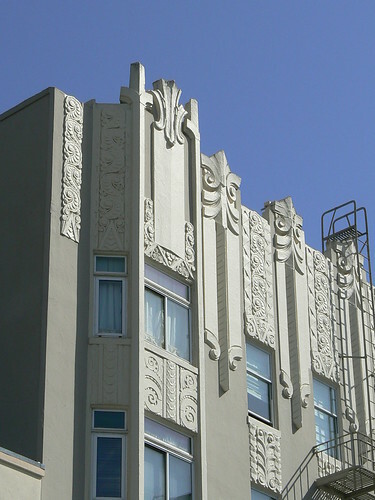 It was designed by Edward G Wylie and built in 1931. You don't often find a car inside a branch of a bank but at this branch of the First Niagara Bank at corner of Main and Jewett in Buffalo that is exactly what you will find. 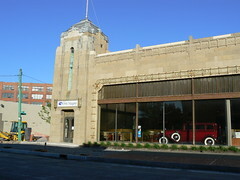 The building had been a Cadillac dealership for many years before it became a bank but the car is a not a Cadillac. It is a Pierce-Arrow. In 1929-30, this . 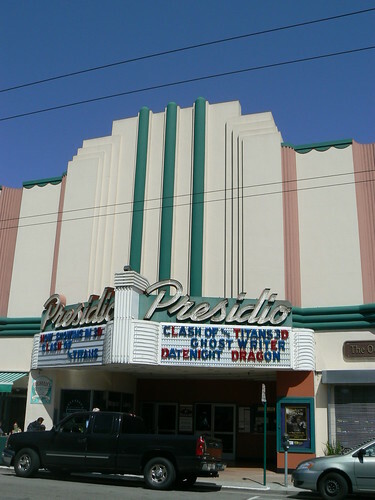 Designed by H E Plumer Associates and Harold F Kellogg it was built in 1929-30 as a Pierce-Arrow showroom did not see out the 1930s with the car manufacturer going bankrupt in 1938. Reference: Narrative History of Braun Cadillac Showroom by David M Rote, accompanying a 1995 watercolour of the building by Dr V Roger Lalli on City of Buffalo website. 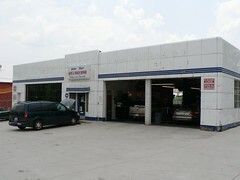 This is Mike Byer Auto and Truck Repair in Asheville, North Carolina. His website says he has been in business since 1988 so he must have acquired these premises from an earlier auto business. In fact you can see a ghostly name across the tp of the facade but I can't make out exactly what it says, it could be "Mike Byer" in which case it is a shame if it has been removed. In any case it is certainly an older building than 1988. It may be post-WWII but it has a lovely shape and I particularily like the three blue speedlines around the buildng and on the small canopy above the door. Tomorrow, at the Moses Mabhida Stadium in Durban, at 4:30 am (!!!) Australian Eastern Standard Time, the Australian football (soccer) team, the Socceroos, take on Germany in their first game of the 2010 World Cup. 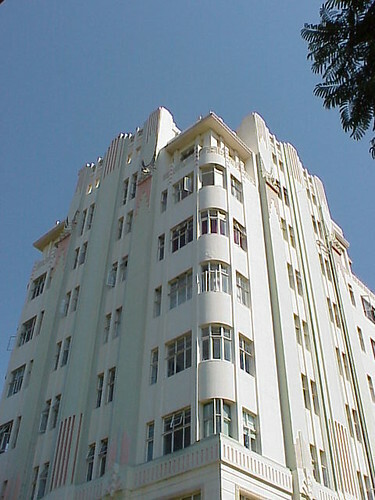 So it's an early night and an early wake-up call for me but not before I show you one of the best Art Deco buildings in Durban. 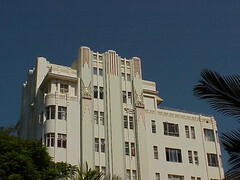 Surrey Mansions dates from 1934. 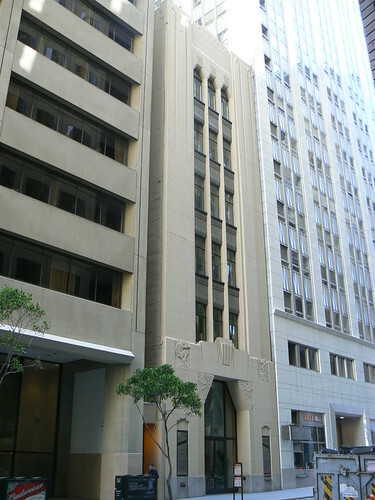 It was designed by Langton & Barbourne and is a knock-out building. 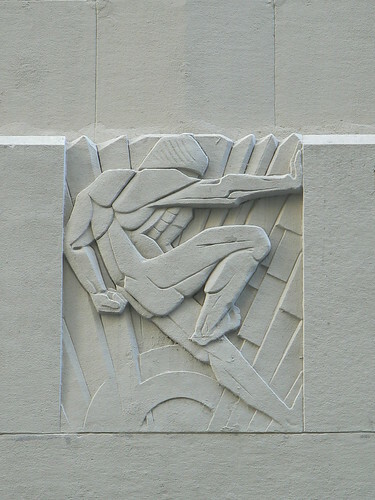 There is some decoration at ground level, especially around the entrance but most of the action is high up on the top floors. 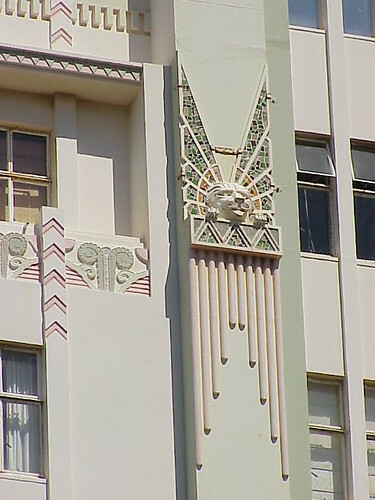 One the small rounded balcony and along the wall below the open terrace, panels featuring stylised Art Deco floral forms are separated by groupings of five chevrons. 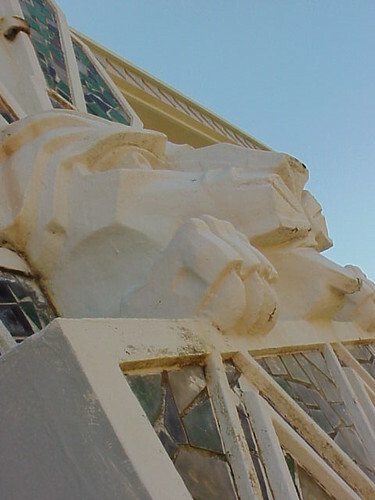 The most striking elements are, however, the series of winged lions that sit on the spandrels between the windows, each one decorated with pieces of broken glass or tile. 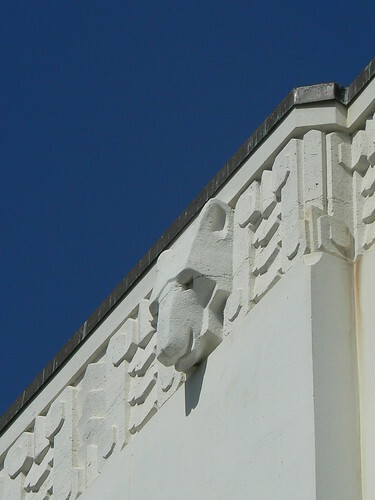 Winged creatures are a feature of Durban Art Deco as the birds on Broadwindsor and the mythical creatures on the Enterprise Building and Victoria Mansions attest. 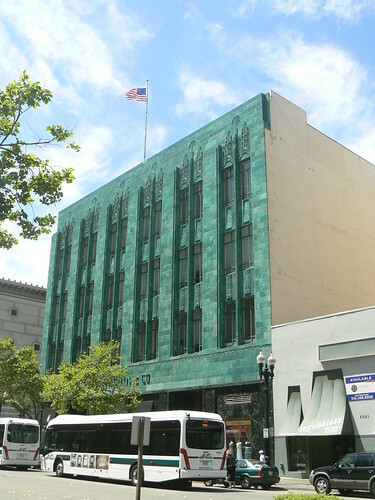 The former I Magnin Department Store in Oakland was designed by Weeks & Day and constructed in 1930. 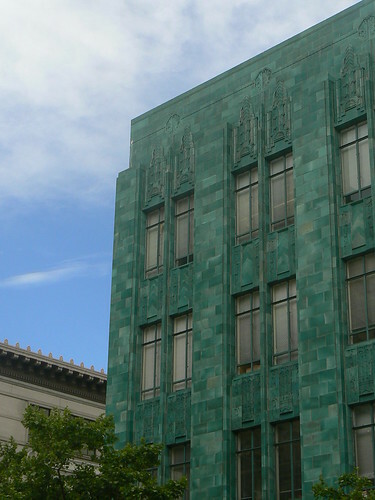 The upper floors of the facade are bright green terra cotta with Art Deco panels above the windows. While all eyes are on South Africa this weekend, I'm thinking of Belfast and I wish I was there. 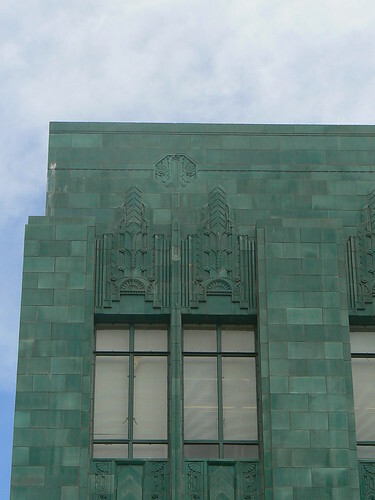 PLACE, the Architecture and Built Environment Centre for Northern Ireland is running a Belfast Art Deco Walking Tour this Saturday at 12:30pm. 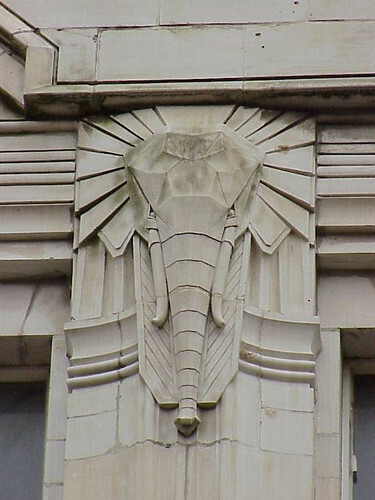 and my personal favourite, the elephants on the former Burton's Store in Ann Street. If there's a tour booklet can someone pick one up fo me ... then we just got to work out how to get it to Melbourne. 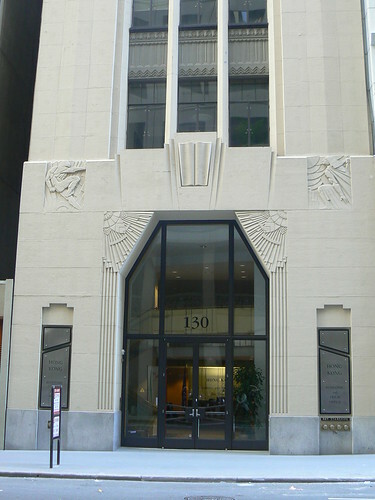 This smallish office block at 130 Montgomery St, San Francsico dates from 1930 and was designed by the O'Brien Brothers with Wilbur Peugh. I like the polygon entrance surrounded by an arrangment of friezes. The element directly above the door is interesting. It could represent a keystone or an open book or both. 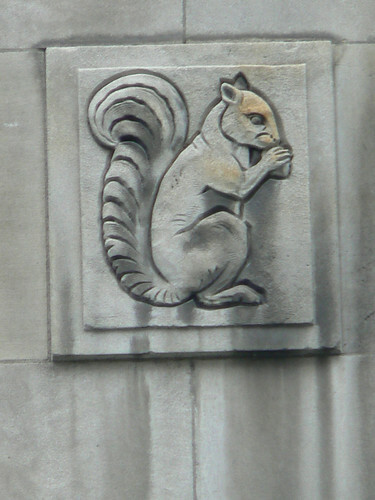 Then on either there are these wonderful stylised figures. 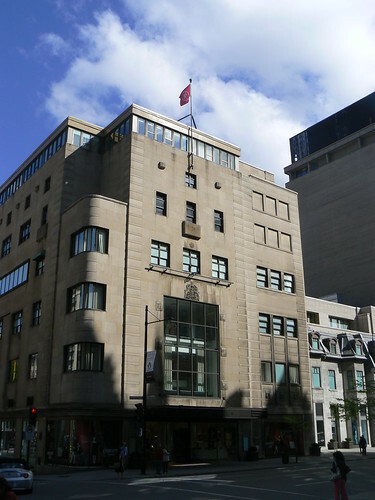 During their Centenary year in 1937, Holt Renfew, opened a new store in Sherbrooke St, Montreal. 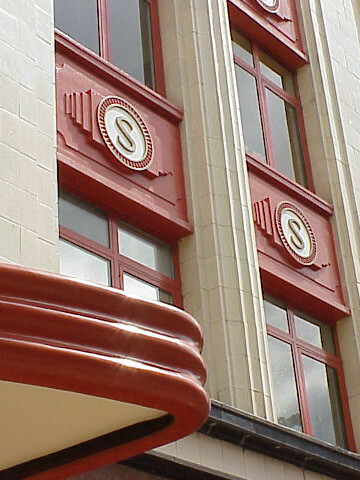 The streamline style building was designed by Ross and MacDonald, one of Canada's most prolific architectural firms. 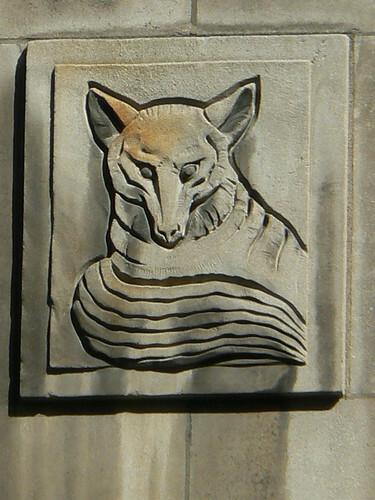 Holt Renfew are promoted as sellers of luxury goods so it is not surprising to find that their early days are heavy influenced by Canada's fur trade and animal motifs are featured on the front of the store. 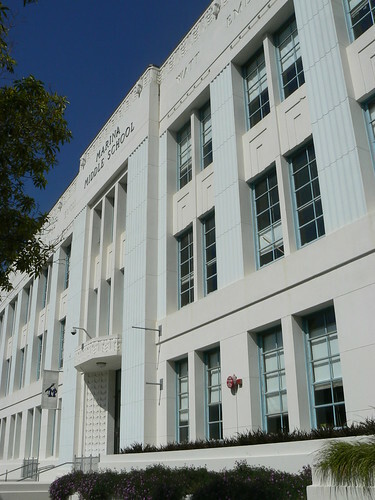 This streamline building in Hastings, NZ is the former Dental and Medical Chambers dating from 1935 and designed by Davies and Phillips. 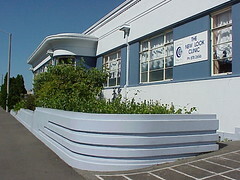 The symmetrical single storey building has offices with curved walls projecting from the facade at each end. Curves at the ends of a low, stepped wall bearing three heavily incised lines mark the main entrance. Then the entrance itself is set back into the building with curved walls creating a shallow porch area. Perhaps the most distinctive feature is the triangle-shaped window projecting from the wall above the entrance. 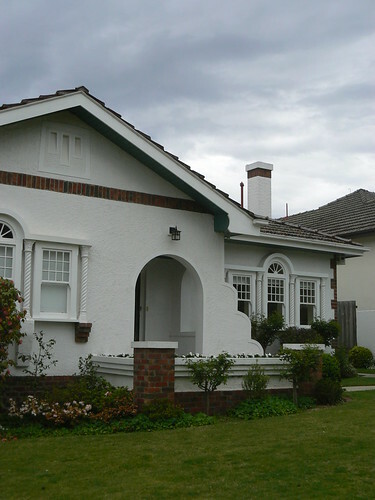 This is an interesting house on the Golf Links Estate in Camberwell, Melbourne. The first aspect that attracts my attention is the rounded stepping wall at the porch entrance. 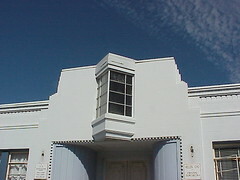 Then there is the arrangement of the windows with the 'barley twist' columns and the fanlight above the central panes. 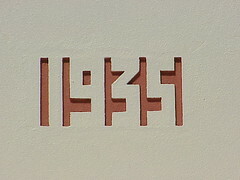 Notice also the decorative brickwork. 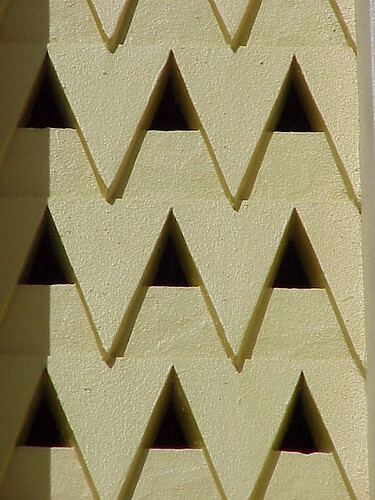 The stepped sets of bricks at the bottom corners of the windows, each holding up a column. The quoining, illustrated best on the right hand corner of the house and the horizontal band of bricks across the gable. Another nice feature is the L-shaped planter at the porch entrance. Besides being a decorative feature it acts as a guide and a barrier, keeping visitors to the path leading to the front door.